Often referred to as the "Pearl of the Orient" the capital of Syria - Damascus, is the oldest and ancient inhabited village. It is assumed that it exists since about 10, 000 to 8000 BC. Today Damascus is also a strategic, cultural and religious center, located in the southwestern part of the country. This priceless ancient historic city is built on a fertile plain through which the river Barad passes. Over Damascus stands with its bare mountain peaks Kasyun, which is part of the Antilivan mountain range. 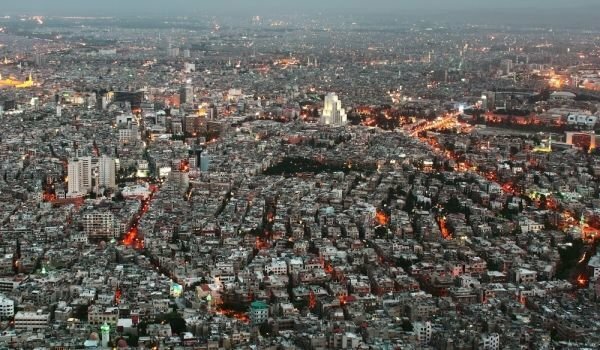 Today in the capital Damascus live nearly 5 million people. Archaeological excavators on the outskirts of the city are adamant that there was a civilization before 10 000 BC. here. Nowadays the modern part of town is not so interesting to tour, because there is nothing to see apart from busy people and chaotic buzz. In contrast, the Old City of Damascus is more relaxed and really amazing. According to a legend on these streets crossed Jesus Christ, on the mountain that overlooks the city, Cain kills his brother Abel. There is almost no fundamental historical figure in ancient times, which has not reached this most ancient settlement - starting with the Egyptian pharaohs, through the Byzantine emperors and kings, to Alexander the Great. One of the most impressive buildings here, the Mosque which was built in the early 8th century, is one of the most famous religious centers of the Muslim world, is ranked third in importance after Mecca and Medina. In earlier times it was even a central place for worship. The building is amazing with its beautiful minarets, white stone and gilded in mosaic fragments yards. Its dome it was rebuilt after being burned in the 19th century. It is believed that Constantinople was built by the masters of the sacred place where for centuries there were religious temples. Today, the architecture of the mosque has links from the temple of Jupiter in Baalbek and moments, typical of a Christian church. Besides many other amazing historical buildings, if you come to Damascus you should visit the central city market, "Al-Hamid". In this rich and vast marketplace you can find all sorts of goods - fruits, vegetables, nuts, all spices, textiles, ceramics, carpets, gold objects and any antiques.